At Minyan Na’aleh, you can expect thoughtful divrei torah, vibrant singing, full and engaged davening, and opportunity to meet or reconnect with friends. We are completely lay-led and have no Rabbi or affiliation with a particular movement. You can expect to be welcomed by a warm community. Our members include young professionals, young families, grandparents, toddlers, and everyone in between. You can expect that any Shabbat events will meet within the East Denver Eruv. Saturday mornings meet at the Mizel Museum and Friday nights meet at members' homes. Following Friday night and Saturday morning services, we have a potluck meal. Please see our community standards if you plan to bring food. Attire runs the gamut from jeans to dresses. Some arrive on foot, others by bike or car. Some of our members keep kosher, others do not. Some come for services, some for dinner, and some for both. Everything is free, and there is no need to RSVP. If you have any further questions, please contact us at naaleh@gmail.com. Kids are a welcome and integral part of Minyan Na'aleh! Please bring them! On Friday nights, children either join in the services or play in a room full of toys and games. Parents rotate supervising the kids as there is no paid childcare staff. Saturday morning childcare is offered through Congregation Rodef Shalom. 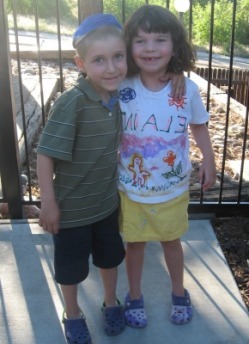 Many children have formed lasting friendships at Minyan Na'aleh and look forward to it every month! At dinner, there is kid-friendly food alongside the delectable salads and entrees.